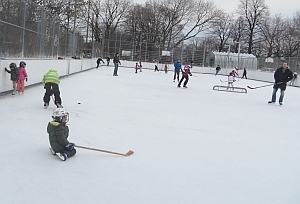 The rinks was scheduled to stay open until March 20, but closed for the season this afternoon. Ironically, this was the one evening when the ice was fine -- better than fine, since it got cold enough for the surface water to freeze, but the ice was so fresh that the zamboni was able to scrape it absolutely smooth. The Thursday night permit group didn't come, because someone from the central Permits office called them and told them their permit was cancelled because the ice was no good. Yet the forecast for a cold night has been up for days. Only three skaters came in the earlier time slot. Seems like people steer by their preconceptions, not by their eyes. Nobody just passed by the rink to take a look, and then tweeted their friends. So much for the lightning speed of social media. Better "rink literacy" by skaters, as well as by staff, is what's needed. During all these days when the rink has been mainly a puddle, there have been 3-4 staff assigned to shifts. 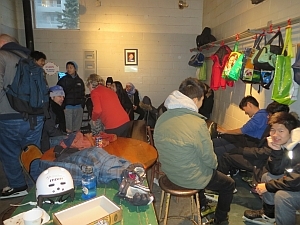 There's been a certain amount of cleaning of the rink building, some food prepared for sale (some of it later discarded), and lots of chatting. Some of the chatting is with the occasional kid who straggles in to confirm, that the ice is wet. Mostly the chatting is with other staff, most of whom seem to be just as bored. The staff have not yet been assigned to seasonal cleanup and sorting, and so they don't do that yet. If Parks and Rec gives youth their first job, one of the first things they learn is how to live with idleness and boredom. There is more talk, and more likelihood, that the bloody fistfight two weeks ago was partly encouraged, or even set up, by a staff person. No one will know whether he got any pushback from his supervisors -- privacy! This seems to be a bit of a slide back into the bad old days of the 1990's when kids avoided the rink because they were afraid of some staff. There is grumbling about the younger staff, who seem to spend a lot of time sitting and chatting in the office while the lone "co-ordinator" watches the rink, signs out skates, shovels the snow, and whatever else needs doing. The coordinator has no authority to actually direct the staff to work, and the supervisor, who does have the authority, is almost never at the rink. Broken. And yet -- because there is still food, and there are still skates, and the staff answer skaters' questions in a friendly way when asked -- parents and teachers often say how nice the rink is: "better than many others." Oh dear. The skates didn't get sharpened for the week because the skate sharpening machine was not brought to the rink from Wallace. The staff showed up for his shift at 6 a.m. but had no machine to work with, so he went home again. This is apparently the third time the machine was not where it was needed. Work to rule: As I'm standing at the side of the rink I see that a rink guard is helping a youth off the ice, who seems to be limping. A group of skaters are at the far end, shoving skate aids around. A parent standing beside me says he saw the group banging each other with the skate aids before, and then the youth fell down. The rink guard is busy helping the injured skater. Another rink staff person is standing nearby, chatting with a zamboni driver. I ask him if he can go and tell the group to bring back the skate aids, so they stop using them to bang into each other. The staff grins, says "not my job," and returns to chatting with the zamboni driver. Later on, another staff is overheard refusing to mop the rink house floor. Another one sits and does their homework. At a different rink, two young staff refuse to help carry in some boxes of skates. Instead they work their cell phones and eat cookies. What rule are they working to? This goes on at all the Ward 18 rinks, not only when there's a "work to rule" action but also the rest of the time. If the shift coordinator says that a staff person should do task and they refuse, the coordinator "writes up" the refusal and reports the refuser to an off-site supervisor. If the refusal happens a few times, the off-site supervisor will maybe have a meeting with the refuser, but the contents of that meeting are a private matter between the off-site supervisor and the written-up staff. And if that staff person/refuser happens to be friends with the off-site supervisor, it may be that the reprimand is rather gentle. Gentle enough, at least, that the refusals continue. The coordinators get tired and discouraged and don't bother reporting the staff anymore; they just carry out the work themselves. Besides, some of the staff are related to each other, or long-time buddies. The person reporting work refusal can find themselves the isolated target of nastiness if they come to be seen as a tattle-tale by a sub-group of their colleagues. The rinks are sometimes a very unpleasant working environment. A glass repair company came by to fix the broken window from the fight two days ago. But the window was already fixed. The contractor said that this was the third work order he had received from the city, to fix the same glass. He charged the city for one glass replacement and two additional trips of no use whatsoever. 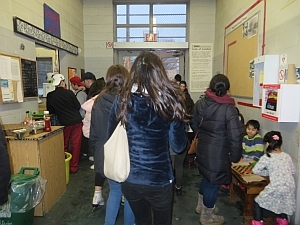 The two daytime staff seemed to be a bit overwhelmed -- two school classes had come unannounced, 60 kids altogether, and many kids wanted to borrow skates or buy food. The teacher said she had tried to contact the staff three times to confirm that they were coming, but no one had responded to her emails. And the group was not listed in the log book. Around 1 pm the skate-lending staff person went on her lunch break and then there was no one to lend or take back skates. There was a food inventory staff in the garage but she didn't come out to help, perhaps because of the work-to-rule instruction from Local 79. So the snack bar staff shut down the snack bar, despite a lineup for food, to go and rent the skates. People strolling through the park at about 4 pm reported that they saw a staff person chasing some youth, yelling at them and the youth yelling back. Staff first said that one of this group had been caught stealing another youth's shoes. But later on the story got more complicated, with a bloody fight breaking out in the men's washroom, and perhaps one of the staff refusing to try and stop it. A larger fight erupted, making a big mess in the change room. Then one group left, smashing the back rink door window as they want out. While one staff person chased after them, another staff person called the police, but they didn't come for another hour. Big confusion. It seems to be absolutely the case now that there are teenagers running the park. It's depressing and it is making a difference to the programs for sure. They don't bother for example to enforce the age rules on the Shinny rink. It is hard to express the difference in spirit between the time when park staff used stuffed animals on the ice to get the little kids (my Joe among them) to learn to skate, and now, when I'm asked if I'm just "obsessed with the rules" because I consistently ask the rink staff to get the grown men off the ice when the children are playing. 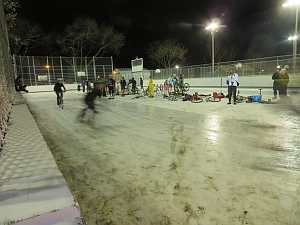 Tonight was the annual bike couriers race on the ice. The weather was warm (11 celsius) and the ice was puddly in the day, but it was plenty thick enough for the bikes. 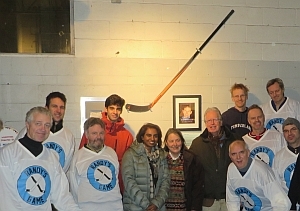 This is the evening when Randy Heasman's stick was put up on the wall beside his photo and the plaque. His Thursday hockey mates were there and everyone had a chance to shake Ashan and Ryan's hand. It appears that 4 of the new pairs of MLSE skates have already disappeared, nobody knows how. It turns out that not only 20 new helmets from this year and 20 from last year have disappeared. So have 19 pairs of new hockey gloves and 20 new sticks. More details here. 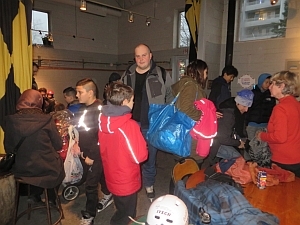 A school class had to keep half the class from skating because they didn't have enough helmets. They come every year and assumed the rink still had helmets. The teachers were unhappy. At 10 p.m., the ice is solid after a day of 15 celsius with intermittent sun. There are at least 25 "beginners' shinny" participants. This is a step-up from the Sunday night shinny hockey practice for new players. There was formerly a staff person assigned to help with the prorgam but he's stopped showing up for his shifts, so the players look after themselves. Half are wearing blue pinnies. The game is pretty fast. Whenever someone scores, everyone from both sides cheers "good goal!" "way to go!" and the players in the hockey boxes thump their appreciation by banging their sticks. A very supportive environment. 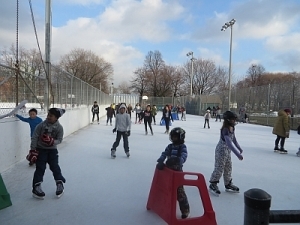 The city's website and 311 listed this rink and all other Toronto/EY rinks as closed at 1 p.m. ("snow covered") but that's not true -- Dufferin Rink was open by 9 a.m. and had skaters all morning, including two classes from Queen Victoria Public School -- happy to skate and happy with the free hot chocolate the rink staff made for them. The staff said they got a call from a teacher from another school, which had been booked to bring students today. Apparently the school got a call from a woman telling them, their bookings were cancelled because the rink was closed. But it wasn't closed. Another instance of the trouble with central, top-down management. 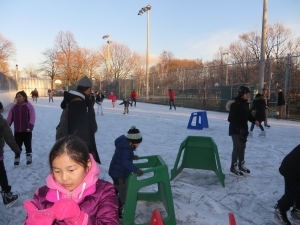 It's time to have a closer look at the Dufferin Rink skate lending program. Is it broken? Should it be put on hold until it's fixed? We think so. We wrote a letter to city management staff, outlining the main problems. The rink was open until the midnight countdown -- skate lending, campfire with hot chocolate, shinny on one side, pleasure-skating on the other. Lots of people came -- it was very cheerful. 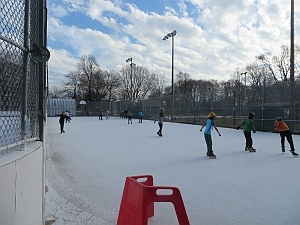 In mid-afternoon, 311 actually got the late opening put up on the city's outdoor rinks web page -- before that, the rink was posted as closing at 9. 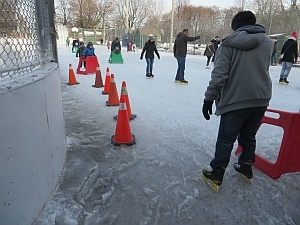 The rink was busy today, with families already waiting outside at 9 a.m. But until 3 pm there were only two staff booked. That doesn't work. A third staff person came early, at one, but even so it was as mess. There are refugee kids who are still picking up the language -- and the customs. There are families with lots of little kids, who sometimes get in squabbles on the ice. Eventually the benches were so full that people sat on the cement outside of the garage to put on their skates. At one point in mid-afternoon, there were between 200 and 300 people at the rink. Why? Maybe because the weather has bee strange and there's pressure on people with kids to go out and do something. Last night's heavy snow super-saturated with rain made it very hard to clean the ice. 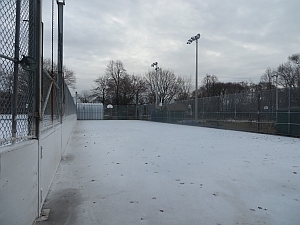 Most rinks citywide were closed all day, but Dufferin Rink was one of three that was open by 3 p.m. One of the rink staff said he hears that a zamboni driver had been at the rink overnight to keep clearing off the snow as it fell. Smart! Yesterday signs went up saying the rink is closed at least until Dec.26. But by 7 pm on the 24th the ice was excellent so the gates were unlocked until 11 pm. This morning the ice is also fine and at 10 a.m. the pleasure-skating side is open. Until noon, the building was locked, there were no skate rentals, and the hockey side was locked. However, there was a staff person onsite to do 6 hours of catch-up skate sharpening. He got worried because people were climbing over the hockey rink gate, so he opened it too. 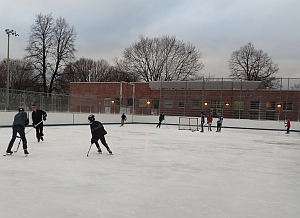 As a result, lots of people got to play shinny hockey, all day until 10 p.m. The washrooms were opened up too, and even though all the skating was unsupervised, there was no damage to anything. 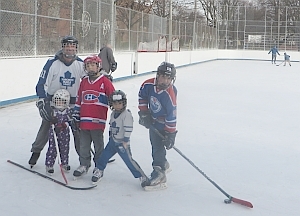 Just a good Christmas Day, not spoiled by the Christmas grinch that locked all the other rinks. I was glad to see that there are three daytime staff today instead of two. A rink guard would be good if you could add one -- for example at 1 pm a group of autistic children arrived, in among all the other people. The group have good staff along but it would be helpful if there was a rink guard to help as well. Also to step in to the skate rental when it gets busy. But for now it's still much better than yesterday, I'm glad you took action. I'm glad you're getting on top of the rink staffing. I was just at Wallace and Dufferin rinks and I heard that people are complaining to staff that the loaner skates are dull. No wonder -- as you know, they are very popular. I am told that skate sharpening shifts were removed from the schedule over the holidays. I hope you can double the skate sharpening shifts instead of cutting them, during this time of intensive use. Schedule a staff person tomorrow (Thursday daytime) to temporarily stock the Dufferin Rink shelves with CELOS loaner skates for those skates that are dull or missing. We have 125 pairs which are already on site in the park storage sheds. They are all marked as CELOS skates, so we can get them back when the others are sharpened. 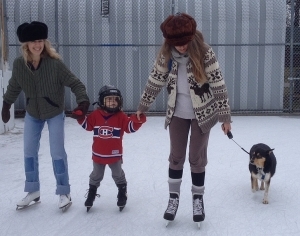 Please let me know whether this can happen right away -- dull skates contribute to falls. I happened to stop in at Dufferin Rink at about 1.30 today. There are only two staff -- that's all you scheduled until 3 pm. I'm guessing you didn't realize that school stopped last Friday. It's a zoo. There was no rink guard, with at least 120 people on the ice. The snack bar had to be closed, and there was a skate-lending lineup to the door. 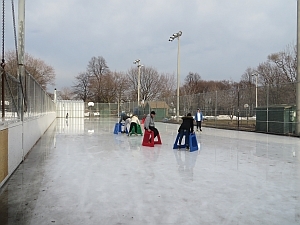 Would it be possible for you to schedule 4 daytime staff for busy rinks like Wallace and Dufferin? This is not only poor service to rink users, and losing revenue, but also dangerous. This is by no means the only instance of this kind of scheduling problem. That's why I have cc'd other PFR staff, and the Ward 18 councillor, here. A whole bunch of rinks are listed as closed, because of the water on the ice. Meantime people are skating at Harbourfront (webcam) and at Dufferin (visit). What makes the difference? A warm day, 9 celsius at 10 a.m. Nets are sinking in a little if they're not moved often. But the ice is okay -- just very few skaters! Maybe they all think it's too warm. Last night the ice was as good as it ever gets -- like a sheet of brushed metal (high of 14 yesterday). Today the ice is also good. 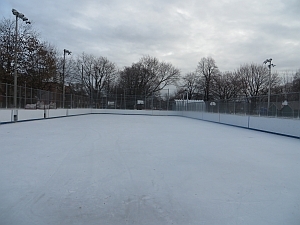 But 13 of the city's rinks are marked as closed at 1 pm. 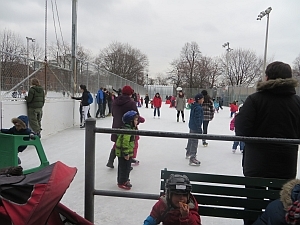 And even at Dufferin Rink there are far fewer people than usual on a Saturday. People keep calling to ask if the rink is open, slightly disbelieving that there can be ice when it's above zero. The city spends $6 million a year to have these rinks and yet even the zamboni drivers seem dubious that the pipes can freeze the ice. 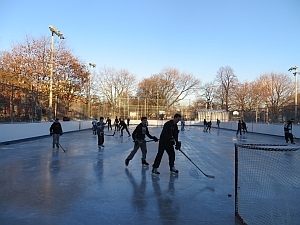 How strange, to have such widespread "rink illiteracy" in the city that tops any other place in the world for the number of compressor-cooled outdoor rinks. At 6.30 pm the rink had a crowd, but it looked bad. Outside on the pleasure-skating side, a solitary rink guard stood there eating a snack, as kids rammed each other with the skate aids and threw other skaters off balance. The rink guard had no skates on, and looked to be very young. Apparently he forgot his skates, and no one thought to get him to put on a pair of the loaner skates. So he stood there on the sidelines, in his helmet but no skates, unfocused. 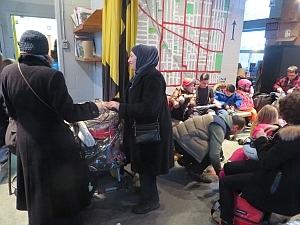 Inside the rink houses, napkins and paper towel were scattered on the floor, hockey bags blocked the entryway, people had to push their way in and out. In the kitchen the sinks were full up with dirty, brownish water and unwashed dishes. The staff looked like they might be overwhelmed, almost paralyzed with the uncertainty of what to do next. It was hard to even know who the staff were. None were wearing staff shirts. One wore her leather school jacket. At the snack bar, someone asked the server if the soup was vegetarian. It's been vegan for years, but the server said he had no idea. The snack bar counter was piled up with sign-in sheets, cell phones, serving utensils, log books. Regulars from days gone by approached me and said, "what on earth is happening here?" If it goes on like this the problem will solve itself. People will gradually stop coming to this rink. 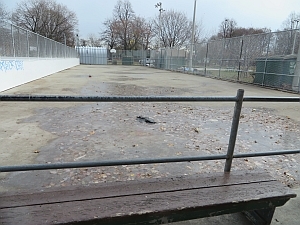 The rink opened at 11 a.m., after the zamboni did some more flooding. It looks thin but the ice is okay. By noon, there were lots of skaters on the ice, especially because nearby rinks had bad ice and/or their change rooms were closed. 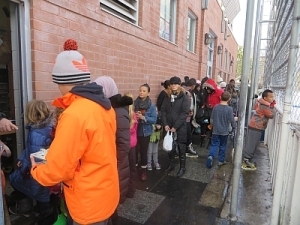 Skate lending was intense -- so many people make use of this service, including newcomers and families whose children's feet have outgrown their skates again. 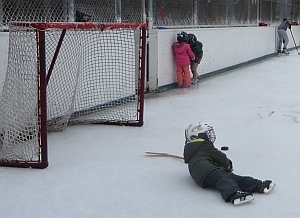 Dufferin Rink shinny hockey, 4.p.m. It was warm all morning, then the temperature began to drop. The rink looked like a lake. And yet, under the water, the ice was solid. So it seems that even bad ice-making technique still ends up in decent ice. Third day of flooding. The daytime temperature was 15 celsius, but the ice stayed mostly white. Then at about 8 pm the rink crew came and soaked the ice, but since it was still so warm, the ice didn't freeze. Looks bad. Second day of flooding. The first day, the rink staff didn't have the key to the new garage, so they used the hoses and connections from the old one. They didn't have the key to that one either, but a rec program staff was in the rink house, cleaning up, so she let them in. Keys!!! The rink staff seem to want to put on as much water as possible all at once, and then they go away and come back some hours later when the ice hardens. It makes for rough, uneven ice. Thin, frequent floods with a nozzle are the standard, and then the ice freezes smooth and beautiful. But that's rarely seen at the city's rinks. The compressors were turned on early this morning. That's earlier than has ever happened since amalgamation, maybe because (ice maintenance staff said) CIMCO has now taken over compressor maintenance from city staff. By 10.30, the leaves had already frozen onto the cement. There were four ice maintenance staff at the rink at 10.30 but they said they couldn't clean off the leaves, would come back later when the above-zero temperatures would loosen them. Since the compressors were on, it may be that the staff had to use hot water to get them off, but by 4 pm, the pad was much cleaner. No mats were put out yet, and the gates were still left open. Inside, rec staff are sorting and sharpening skates, still putting the last remainders of the summer programs away in the various park storage sheds. 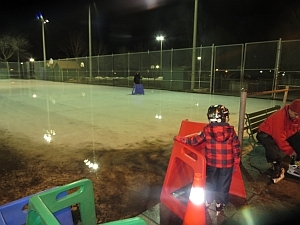 Back in December of 2001, most of the city’s outdoor rink pads were still closing every day at 9 pm. Dufferin Rink friends thought that was a shame – the rink season is so short, the moon is so bright in those cold winter skies, shinny hockey is so well-loved. There was no money for staffing, but a rink friend had the keys, so some of us started keeping the rink open until 11 pm when we had time. Word got around. Soon, rink friend Randy Heasman came with a proposal: he wanted to have a regular slot for an “over-35” neighbourhood shinny game, to get some of the older guys back into playing. So we made sure the rink was always available for them on Thursdays after 9pm. Randy knew a lot of people, and the program was a success right from the beginning. It's now been renamed "Randy's Game." A neighbourhood women’s hockey group showed up next. Then we put in a couple of regular nights for youth drop-in, with an anonymous donour giving the city $769 to fund staffing. Extended hours at Dufferin Grove caught on, and after a few years the city decided to staff them every night. 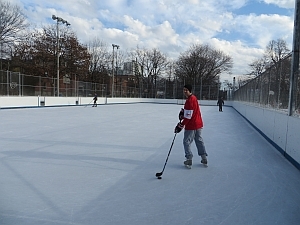 Many other rinks began to stay open later too. On the part of the local shinny players, though, an anxiety arose – that a new one-size-fits-all citywide permit system would take away after-9pm community shinny times and replace them with centrally-booked permits. That was the city’s plan. So Randy’s Thursday night group, for example, might be assigned a rink slot in Scarborough, while a group from Etobicoke would have to travel to Dufferin Rink on that night. Randy said, don’t despair. 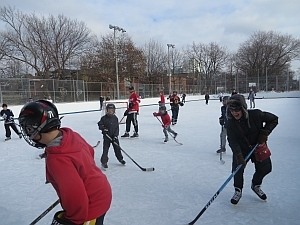 In his friendly and determined way, he lobbied to let the “local-older-guys” and the other neighbourhood-based groups keep their games at Dufferin Rink. Randy's group is now in its fifteenth year. Some of those over-35 guys are now over 55. Randy died in May, of non-Hodgkin’s Lymphoma, at age 58. His memorial gathering was overflowing, and it included many shinny hockey players, male and female. 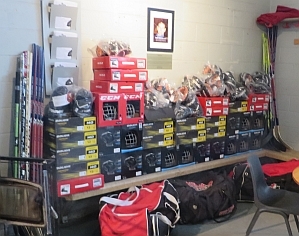 Recently, the NHL Players’ Association made a donation of 20 new sets of shinny equipment (skates, sticks, gloves and helmets) for kids and youth, to CELOS. The equipment will be used at Dufferin Rink and will also be loaned out for shinny hockey to other rinks across the city. The donation came partly as a result of an enthusiastic letter of support to the Players’ Association from Randy, written two years ago. 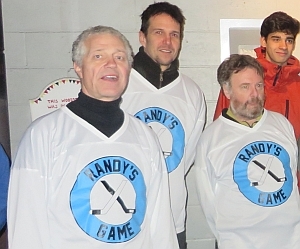 The loaner skate collection will now be called “Randy’s loaner skates,” and Randy’s wife Asha is donating a plaque, a photograph, and Randy’s latest hockey stick to be mounted on the rink house wall. 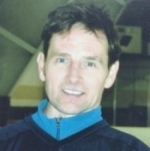 The October 3 outdoor “shinny hockey supper” is to remember the many enduring gifts Randy leaves behind, because of his steadfast enthusiasm for sport, and for people. Some of the original park supper cooks are returning to make a delicious meal. Everyone welcome!